I made a rookie mistake with my contribution to this month's MxMo: I didn't do my homework. Turning to David Wondrich's Imbibe! for some historical reference, he bandied back and forth about possible creators and locales for this classic's creation. Perhaps it was created many places and many times, for sweet vermouth was the new hot ingredient of the 1870s and 1880s as St. Germain was in 2007 and 2008 (and arguably even to today). Wondrich quoted from the anonymously penned 1898 Cocktails: How To Make Them, "The addition of Vermouth was the first move toward the blending of cocktails." In my mind, the Manhattan takes the Old Fashioned one step further. Not only does it replace the sugar with sweet vermouth, but this sweetener ties its herbal notes to those of the bitters and its spice notes to the barrel-aged whiskey (especially rye whiskey) as well as the bitters again. So no sugar in a Manhattan and in this Esquire article Wondrich is adamant that a Manhattan on ice is not a Manhattan. Therefor my offering has an appropriate low brow New York name: The Gowanus - named for a neighbourhood in Brooklyn thru which one of the most polluted canals in the US runs. It's said to be 90 procent guns and the rest is industrial waste. Add all ingredients to a mixing glass, add ice and stir. If you want to present this non-Manhattan drink, as a Manhattan - serve it up in a coup - or be a rookie like me and serve it in an old fashioned glass over ice with a garnish of a piece of fresh rhubarb gently poached in the rhubarb-sriracha-syrup. Should you want to mix a more true riff on a Manhattan, take a look at some of the other contributions in Freds wrap-up. I am always late to the Kentucky Derby Party - but I guess I have the best excuse: I am 4387.94 miles as the internet flies from Churchill Downs. How could anyone be expected to accurately time a drive like that? This year however I was awake during the actual race - not that I was following it, I was working. But as an after party I mixed myself a spring julep. Where the Kentucky Derby may be definite proof spring has arrived in parts of the US, here - in Denmark - rhubarb is that incontrovertible marker. So I started by cooking a good bunch of rhubarb cut into chunks with 5 cl sugar and 1 dl water for about 10 minutes - I added two sprigs of rosemary and a bit of fresh lemon peel as it came to a quiet boil. Fill a nice glass or Julep cup half up with crushed ice - add the bourbon, rhubarb cordial and Fernet Branca and give it a few stirs. Fill with crushed ice - stir again and if any of the ice is above the drink drizzle it pink with a little extra crodial. 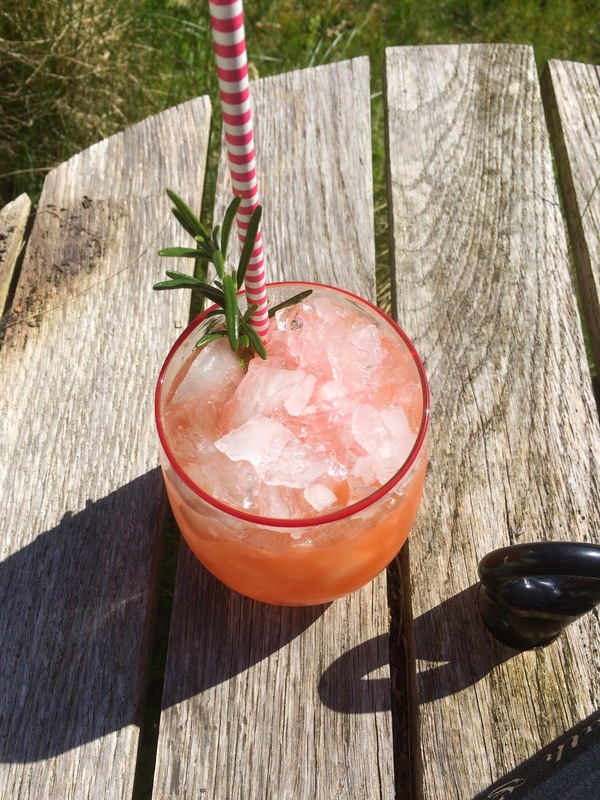 Garnish with a sprig of rosemary and a straw.